CLICK HERE to listen to Episode 93 of the Speaker podcast in which host Gwyn Campbell and Cosmo DNA editor Tim Eldred discuss Chapter 3 scene by scene. Due to the Gatlantis attack, Yamato is buried under a collapsed mass of rock. Directly above, in the orbit of the eleventh planet, an enormous number of Kalaklum-class battleships begins to gather. They form up into a huge cylindrical shape called a Legionnaire Cannon, a giant cannon that concentrates and fires the energy of the collapsed artificial sun. The target of this massive weapon…is Earth. If the Legionnaire Cannon is activated, Yamato and the surrounding space, including the eleventh planet, will be disintegrated. Furthermore, the energy wave will strike Earth. It is clear to everyone that the only way to overcome this situation is to use the Wave-Motion Gun, but Kodai agonizes over breaking the promise between Starsha and Okita. However, the time for a decision is imminent. At Keyman’s suggestion, Kodai points the Wave-Motion Gun at the artificial sun. It isn’t a killing shot. The Wave-Motion Gun avoids the fleet and hits the critical reactor of the artificial sun. Due to the disruption wave that occurs, the Gatlantis ships lose their flight capability. With Gatlantis no longer able to fight, Kodai calls for a withdrawal. But does Gatlantis possess the spirit to forgive an enemy? Hijikata, who is now on board Yamato, is concerned about what this act will lead to in the future. In the aftermath, Saito counsels Kodai against pride; after all, most of the inhabitants of the eleventh planet could not be saved. Zordar’s appearance in Episode 7 is impressive, seemingly having grasped Kodai’s psychology. Mazer, who is Cosmodart’s superior, originally appeared as a pilot belonging to Goland’s advance fleet in Episode 9 of Yamato 2. He was captured by Kodai and Kato, and based on his behavior it gave the characters an opportunity to recognize that there were “good men” among the enemy. His role this time is completely different. Episode 8: The trap on Planet Stravase! Yamato entrusts the rescued civilians to the Garmillas fleet, but a number of traps await on the planet Stravase. Yamato survived a critical situation, but the next challenge is to send the eleventh planet’s refugees back to a waiting Earth. However, there is no time to return to Earth, so Keyman proposes the planet Stravase, located in the direction of Telezart, and it is decided to turn the refugees over to a Garmillas fleet heading for Earth. Survivors of the attack on the eleventh planet are rounded up, including Admiral Hijikata and a strangely-behaving Professor Redrauz. In the midst of preparation for departure, Kodai is surprised when Yuki appears. She secretly boarded Yamato, but Kodai doesn’t want her to accompany him on this dangerous voyage, so he commands her to leave for Earth with the refugees. Yamato rendezvous with the Garmillas fleet at Stravase and begins to transfer the refugees. Keyman meets in secret with Garmillas officers and receives a device that can scuttle Yamato’s engine. Professor Redrauz takes off alone to investigate ancient Akerian ruins. Kodai and Touko Katsuragi take off to retrieve him, finding the ruins and a huge ancient heiroglyph with an image of both the White Comet and Teresa. Kodai is hit from behind in the ruins and knocked unconscious. Meanwhile, a threat approaches Yamato. A rebel band of Garmillas calling themselves the “Destruction Liberation Army” attacks and Yamato heads out to intercept them without Kodai. Keyman uses the distraction to install his secret device in the engine. The meeting between Kodai and Yuki in her nurse’s uniform was an important scene in the early stages of both Farewell to Yamato and Yamato 2. The content of their conversation is almost the same, but this time it is suggested that everyone except Kodai knows that Sado harbored Yuki as a “stowaway.” Yuki shows her independence in support of Kodai, which is a very modern depiction. Encounter with Great Emperor Zordar of Gatlantis. Kodai is urged to choose “love” in an overwhelming sense of intimidation. From behind the rebel army, interplanetary missiles approach. When they strike, Stravase will collapse. Since acting captain Kodai is still absent, it is Hijikata who commands Yamato. Elsewhere, a talk between Zordar and Kodai continues in the ruins through the body of Professor Redrauz. Zordar explains the origins of Gatlantis as superior manufactured soldiers with mastery over all, and a greater knowledge of “love” than anyone in the universe. He defines “human love” as ego and preaches the belief that it will annihilate everything. He reveals that human bombs lurk on all three Garmillas ships that carry the refugees. Only one ship, to be selected by Kodai, will be spared. Zordar offers Kodai this choice to test his “love.” Saito arrives and Kodai is rescued just as Professor Redrauz bursts into light. Only one of the three ships can be saved. As proof of Kodai’s ego, Zordar predicts that he will choose the ship carrying Yuki. Kodai is cornered into saving Yuki at the cost of many lives, and explains this to everyone on the three refugee ships. However, Yuki senses the situation from Kodai’s unusual state and decides to remove herself as the cause of his suffering. She throws herself off the Garmillas ship and her body drops toward the collapsing planet Stravase. Kodai desperately dives after Yuki in his Type 100 scout plane and as they fall into a void inside the collapsing planet, they pledge their love to each other again. Hijikata orders the Wave-Motion Gun to fire at Stravase, counteracting its collapse and saving everyone, including all three refugee ships. This episode brings Kodai’s anxiety and suffering as acting captain to its peak. In the original work, a dialogue between Zordar and Kodai was achieved indirectly at the climax. The identity of Gatlantis and Zordar’s definition of “love” are delivered here from his own mouth. Another point is the presence of Hijikata on board Yamato. 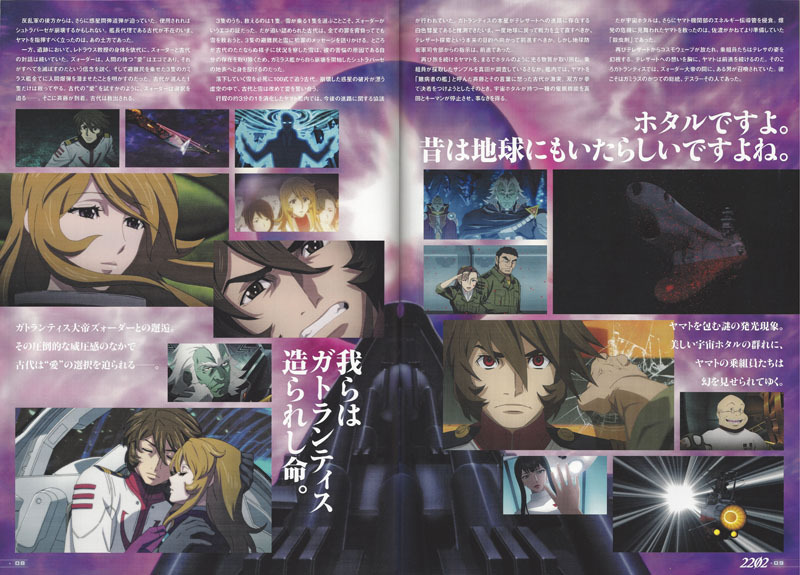 He takes command in the absence of a captain, which gives him the position he had in Farewell rather than in Yamato 2. Goland’s fleet has surrounded Telezart, which is now nearly covered in a rocky shell. The officers await their next orders from Zordar, who broods over his recent loss at Planet Stravase. Yamato has completed about one third of the voyage and the future course is being discussed. It is suspected that Gatlantis is the white comet, which is on course for Telezart. Once they return to Earth for reinforcements, they can continue on with the original purpose of searching for Telezart. However, orders from Earth Defense Command are to advance. Yamato continues on its course, surrounded by a swarm of material that shines like fireflies. Sanada examines a sample gathered by the crew. Kodai and Saito, among other members of the crew, begin to act strangely. Kodai gets angry at Saito, who calls Yamato “a ship of cowards” and the two are about to clash. As they both prepare to settle it with their fists, Sanada and Keyman discover that the fireflies cause a kind of hypnosis and bring it to a stop. Kodai and Saito recover their wits. However, the space fireflies are eroding the energy conduction tube in the engine section. 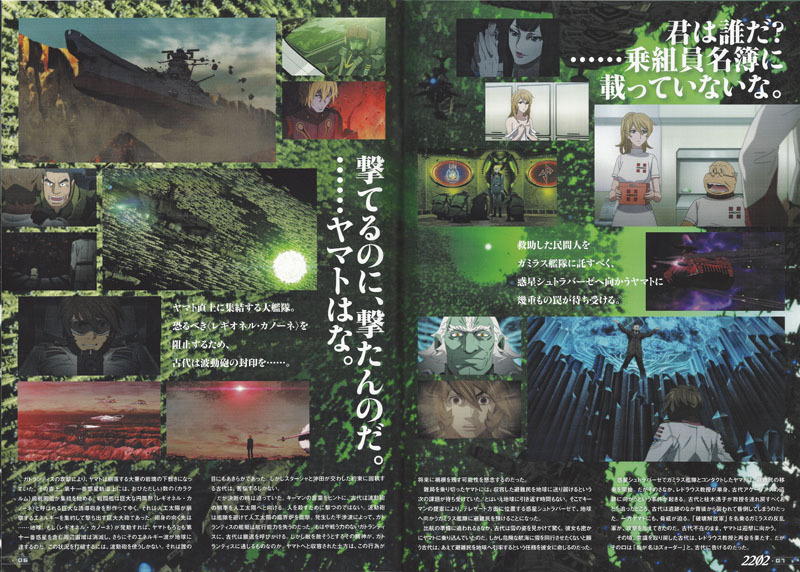 Yamato faces an explosion, but Sado has already prepared an “insecticide” to save the ship. Another cosmo wave erupts from Telezart and the crew has visions. Sanada sees Mamoru Kodai and Kodai sees Captain Okita, who commends him for doing well. With thoughts of Telezart in their hearts, Yamato continues forward. At Gatlantis, a man is summoned before Zordar. He is the former leader of Garmillas, Dessler himself. The main members of the Gatlantis side fully assemble. Among Goland, Zabaibal and the others, Noll appears as an original character in 2202. A pseudo parent-child relationship is depicted with him as a “larva body” (a clone of Goland). The space fireflies were originally the main gadget in Episodes 11 and 12 of Yamato 2. As a member of the Gatlantis side, Dessler released them as metal-eating “bacteria.” Wouldn’t a lot of fans expect his reappearance, also? A new trial suddenly befalls Yamato! What could it be? Suspected spies on board, an encounter with the White Comet of Gatlantis, and Yamato reaches Telezart after overcoming many hardships. But waiting there is a defense fleet led by Goland and a land division led by Zabaibal. Everything leads to an encounter with Teresa to learn the true meaning of her message. Kodai’s readiness will be tested as he reaches the destination, Telezart. Titled Destiny Chapter, the next film contains episodes 11-14 and is scheduled for release on January 27, 2018. See a handful of stills at Dengeki Hobbyweb here. Please don’t be late ke farewell Yamato…please don’t be like farewell Yamato…. Please don’t kill everyone like in farewell Yamato…..
Great work, Tim. It would have been nice if the synopsis could touch on some of the more intriguing elements in this chapter… such as Kiman receiving the bended knees of the other Gamilons, as well as Katsuragi’s attempt at flirtation with him. Oh, and of course I think that something should be said regarding Zordar’s ability to see through the eyes of others over astronomical distances. It’s getting interesting. Thanks! These synopses can go only so far for now. Scene-by-scene stuff will happen when they evolve into commentaries. Meanwhile, there are the podcasts to fill in major gaps. 2.5 million ships… reallly…. that took me out of it completelly.. If the Gatlantis had 2.5 million Calaklum class ships (wich we saw to even be impervous to standard ship’s fire) they could simply run over Gamillas and Earth combined forces with easines.. several times over.. and then some more..